A good, but not great, basic, value-priced super-automatic. For the right user, it’s amazing, but many people will be underwhelmed by its limited feature set. Recommended for: People on a budget. People new to the world of specialty coffee drinks. Anyone who wants to practice their Barista skills. Are you new to the world of specialty coffee drinks? Are you on a budget and don’t have a lot of money to spend, and more importantly, are you looking for a basic machine that will allow you to practice your budding Barista skills? If you answered yes to any of those questions, then you’re going to be very intrigued by our detailed Saeco Pure review. Fair warning: This machine is not for everyone, and that reality is reflected in our scoring. That’s not an indication that it’s a bad machine, just that it is focused on a fairly narrow segment of the market. For the right user, it’s pure gold. We’ll cover every aspect of the machine in the sections that follow so you’ve got all the information you need to decide if it’s a good match for you. Let’s jump right in and see what this little guy can do! The Saeco Pure espresso machine has a relatively small footprint, measuring 13” x 8.5” x 16.9,” and weighs just seventeen pounds, and because it’s not a space hog, it’s ideal for people who live in apartments, have smallish kitchens and limited counter space. It’s all-black and made of sturdy ABS plastic to keep the cost low. With its understated but not unattractive design, it will blend in well in most home kitchens. 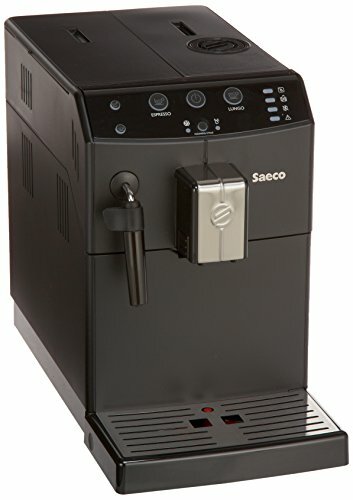 A lot of other Saeco Pure espresso machine reviews sing the praises of the model for its water reservoir, and with good reason. Right off the bat, we were impressed when we saw the size of the top-loading water tank. It holds an impressive 60-ounces, which is enough to keep pace with a single power coffee drinker, or a large household with several casual drinkers. The tank is designed to accept a water filter, but unlike most other Phillips Saeco machines, one is not included with your purchase. If you want to use a filter, you’ll have to buy it separately. In fact, this holds true of just about all the extras that usually come with a new machine. On higher priced models, you get a grinder brush, and an assortment of other necessary cleaning supplies to get you started. That’s not the case here. You get the machine itself, a grinding wrench, and little else. All the extras went out the window to help keep the price down. Back to the filter though, we have mixed opinions about the need for it. On the one hand, if you opt to use a filter in the reservoir, you will save yourself some time on maintenance, as it virtually eliminates the need for descaling. The downside to that is that filters are expensive, and you’ll find yourself having to buy more at regular intervals, which will significantly increase your total cost of ownership over time. Not good. Plus, there are other ways to minimize the need for descaling. You could, for instance, simply use distilled water and accomplish the same goal. In any case, a filter is an option if you’d care to use it! First, it uses stainless steel burrs. That’s cheaper than ceramic, so it’s no secret why the company used them, but stainless steel heats up as it grinds, which can result in burned grounds, which in turn, can ultimately ruin the taste of your coffee. It doesn’t happen all the time, but often enough that it can be both problematic and annoying. Second, it only offers five grind settings. The current industry standard is six, and you can find machines with 12-18, which puts the Pure on the low end of the scale in that department. That matters because the grind of your beans can dramatically impact the flavor of the coffee you get. More grind settings allow you to dial into your particular flavor preferences quite precisely, and you just don’t have many options here. For some users, this will be all right, but don’t be surprised if you begin to feel you’ve outgrown this model after a while. Another annoying aspect of the grinder is that it requires a special tool (grinding wrench) to adjust the grind settings. Then, of course, since the grind wrench is being used so often, there’s the very real possibility that it will be misplaced at some point, which means that until you order a replacement, everybody’s stuck with the last grind setting used. What we’ve seen on some models is that they offer a generously sized water tank, paired with a tiny bean hopper, or vice versa. When that happens, it feels like you’re constantly having to stop what you’re doing to attend to one or the other or both, which can get old quickly. Thankfully, that’s not the case here! One final note about the grinder and this is true of super-automatics in general, and not limited to just the Pure. 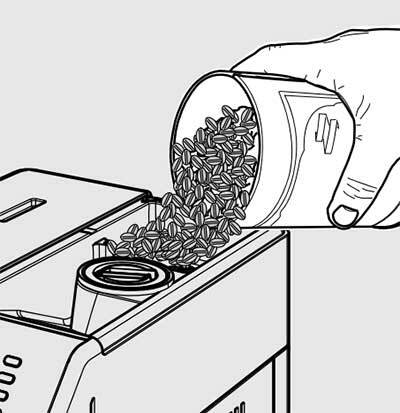 They don’t do well with oily beans, which can clog the grinder and lead to a messy and time-consuming bit of maintenance. For best results, stick to medium roast only! We’ve gotten questions about this, so we included a special short section. Although there appears to be a one-scoop bypass doser, it is nonfunctional! Sorry, but you cannot use pre-ground coffee in this machine. 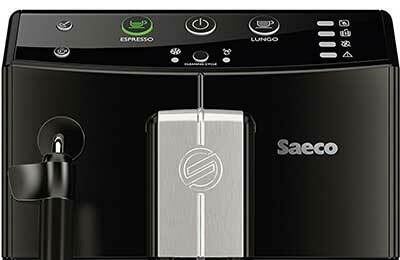 The Saeco Pure super automatic espresso machine uses a single boiler system, which means that it can’t simultaneously steam milk and brew coffee, so if you’re making a milk-based drink, you’ll need to give the boiler time to shift gears from one task to the other. This wait time is measured in seconds, rather than minutes, so it’s not a deal-breaker for most people, but it is something to be mindful of. Saeco has taken one important step to minimize the wait time, by incorporating Thermoblock technology into the aluminum, stainless steel-lined boiler, which allows for rapid heating. If you’re brewing a small shot of espresso, this means that the spigot will be somewhat farther from the rim of the cup than is optimal, and will result in less crema. Again, not a deal-breaker, but something to be mindful of. Although this is the heart and soul of our Saeco Pure review, there’s not much to talk about here, because of the machine’s limited feature set. The brew unit is removable and has a dedicated drip tray inside the machine. You can access both of these from the right-side panel and should remove the brew unit and its drip tray about once a week for a thorough rinsing. As far as the control system is concerned, there’s no LED, LCD, or TFT (Thin Film Transistor) screen at all. In fact, the machine only has a total of five buttons and about as many warning lights. 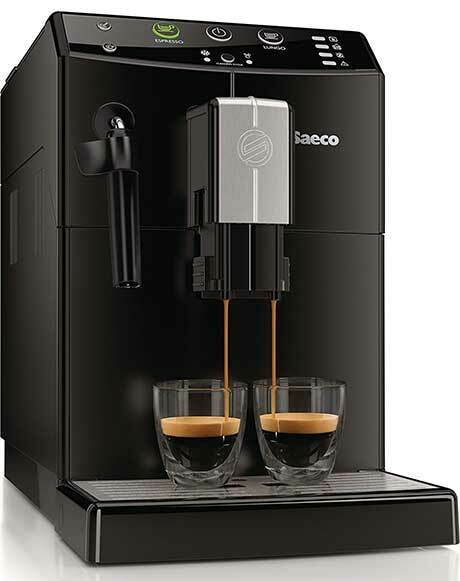 It does offer one-touch convenience, allowing you to brew espresso or lungo at the touch of a button. While you can adjust the length of your shot (how much water it incorporates), one significant limitation is that you cannot adjust the coffee strength, which controls how many beans are ground per shot. Here, the best you can do is set your grind finer for a more robust flavor or use less water. ​Those are your only options concerning increasing strength. The unit is designed to shut off after thirty minutes of inactivity, and while this can be changed on pricier machines, there’s no way to adjust this feature on the Pure. Since the only one-touch functionality you get from this machine revolves around espresso, if you’re new to the world of specialty coffee drinks, it’s important that you understand the fundamental difference in the brewing process and how it differs from the drip-brew coffee you’re used to. Drip brew machines rely on simple gravity to get the coffee from the grounds chamber to your cup or pot. Super-automatic coffee machines are different. They rely on pressure, which is measured in bars. One bar of pressure is equal to atmospheric pressure at sea level. 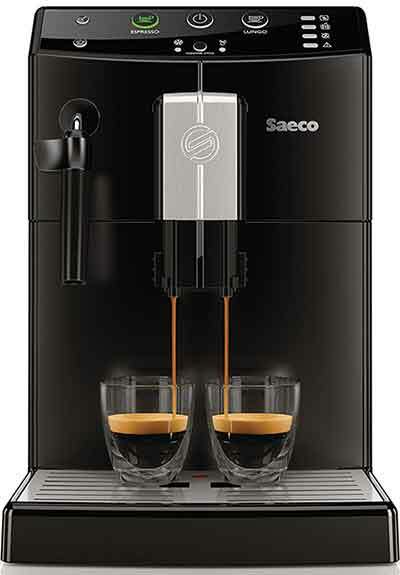 It takes a minimum of 9 bars of pressure to make espresso, and the Saeco Pure is rated at fifteen bars. All that to say you won’t have any trouble getting world class espresso from the machine every time you use it. Pro Tip: When using this machine, you may want to hold your cup such that it’s just below the coffee spigots if you’re using a short cup. This will improve the character of the crema you get. In our view, this is hands-down the best feature of the machine, and if you’re an aspiring Barista looking for a machine to practice with, we think you’ll agree. The frothing wand is awesome. Not only does it double as a hot water dispenser, adding a bit of versatility to your machine, but when you manually froth milk, you can make it as hot as you like, and control the quality and amount of froth you get to a much greater degree than any auto-frothing system offers. That’s a big win, so don’t be daunted by the prospect of learning how to use the wand. Just expect that your first 3-4 milk-based drinks aren’t going to turn out quite like you planned and keep practicing. Once you master the frothing wand, you can make some real coffee magic happen! 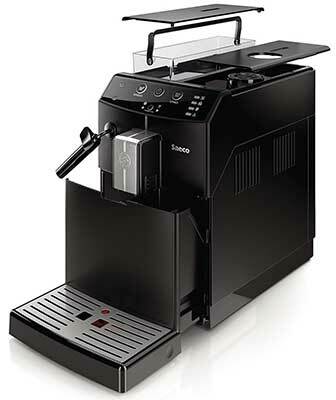 This will be a short section because sadly, the Saeco Pure Automatic Coffee Machine doesn’t have a cup warming tray. We wish it did. The reason is that specialty coffee drinks were meant to be enjoyed at lower temperatures than most Americans drink their coffee. 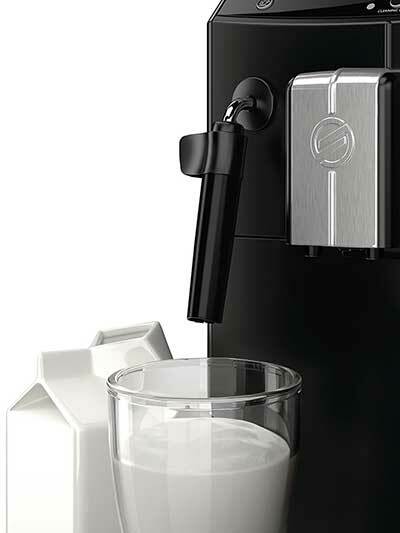 The change in temperature can be especially jarring where milk-based drinks are concerned, and made worse still if you dispense your drink into a cold cup. In the absence of one, your best bet is to fill the cup with hot water and let it pre-heat while you’re doing your prep work, then dump the hot water into the drip tray when you’re ready to brew. It’s not a perfect solution, but it’s simple, effective, and gets the job done. There are few machines on the market that can match the Pure for ease of use and cleaning. Warning lights will flash red when some aspect of the machine needs your attention, and all the components you need to manually clean (dregs box, brew unit, and drip tray) are easily accessible. The machine is also fairly smart about its own maintenance, and when it hits the auto-shutoff time, if a drink was brewed while the machine was powered on, it goes through an auto-rinse cycle. Likewise, if left off for more than two weeks, it will initiate an auto-rinse on startup. You can, of course, perform a rinse any time, and it’s recommended that you do so at least once a day, and ideally, after every milk-based drink, you make. With so few buttons, there’s no learning curve to speak of. In fact, the drip-brew coffee machine you’ve got now likely has more buttons and complexity than this machine. It’s simple, elegant design and limited functionality combine to make it incredibly intuitive. As you can see, this is a very basic machine with limited functionality. Although it does offer some one-touch operation and a complete “beans to brew” experience, it lacks the little finishing touches and convenience features that many super-automatics have. All of this was done in the name of keeping the price as low as possible, and while we understand the goal, if we could recommend a single change to the unit, it would be replacing the stainless-steel grinding burrs with ceramic ones. Otherwise, we consider it very good at what it does, and wouldn’t change a thing. As you can see from our Saeco Pure review, this model is quite solid. It’s a bare-bones design, sure, but the things it does, it does well. Then you’re going to love this model. The fewer of those conditions that apply to you, the less you’ll appreciate its simplicity. On that basis, we recommend it, but provisionally. All About Milk Foam and Coffee. Serious Eats. How to Clean a Reusable Coffee Filter. HuffPost. Guide to Making Latte Art. Blue Bottle Coffee.